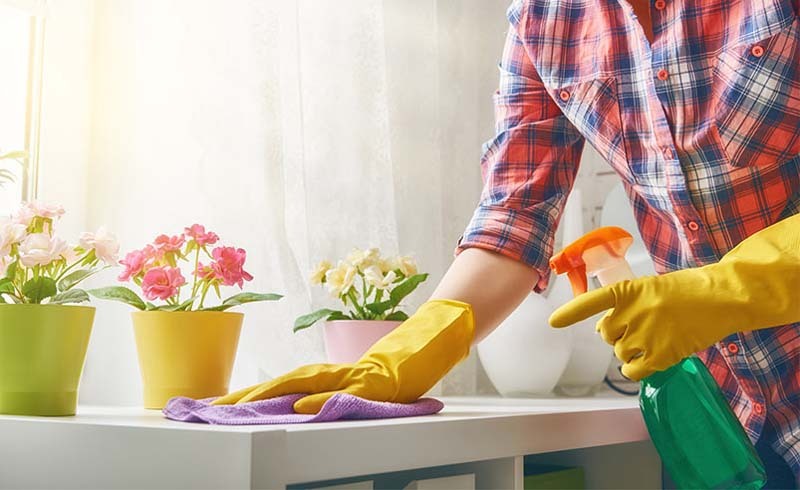 Even when you stay on top of your regular chores and spend time ensuring your house is clean and tidy, there will always be spots that get neglected, meaning dust and grubby marks can accumulate. When that happens, there's just one thing for it – a good old spring clean. From the ingredients you need to leave your fridge sparkling and how to deep clean your carpets, these are the spring cleaning top tops you need to know. Before you can even think about tackling a deep clean, first you need to get rid of clutter. Look through your wardrobe, drawers, book shelves and cupboards, and be honest – have you used these things in the last six months? Or realistically, is it something you'll use again? If not, you should consider either throwing it away, donating to charity or even selling on a site like eBay. Who knows, you could be sitting on some extra cash, too. You may think that bright spring day is ideal for cleaning windows as it will show up any spots or streaks. But if the sun is shining directly on the window it can also mean the cleaner will dry on before you're able to wipe it off, leaving hard-to-remove streaks and making it look even worse than before. Sure, you vacuum regularly, but hair, crumbs and dust can still really build up within carpets, no matter how clean you are. Take the opportunity to remove all furniture from your room and hire a professional or use a high-performance vacuum cleaner to clean the entire carpet – including patches that are normally hidden from view. Not only will this ensure your carpets are pristine, it will also help to restore the condition and leave them feeling softer and in better condition than ever. We're all guilty of neglecting the fridge when cleaning, whether it's leaving out of date items lingering on the top shelf or not properly wiping up spillages. However, it's easy to deep clean your fridge, and should be done every three to six months. Start by clearing your fridge of all food, taking the opportunity to get rid of items that are past their use by date or won't be finished, before removing shelves and salad drawers for a clean in washing up liquid and warm water. Next, use a solution of sterilising food and cold water to wipe down the inside of your fridge, paying attention to the spots where shelves and drawers rest, before drying thoroughly with paper towels. Swap harsh chemicals for a natural alternative like bicarbonate of soda, which works well as an oven cleaner when mixed with water. Spray the solution onto the interior surfaces of your oven, taking care to avoid the heating elements, then leave overnight for best results. The next day you can simply wipe clean for a sparkling oven with minimal effort. Limescale can quickly build up in appliances such as your kettle, iron and coffee machine with regular use, particularly if you live in a hard water area. Prevent your appliances from getting any long-lasting damage by descaling regularly, using a solution. There's no point expecting your dishes to come out sparkling clean if you don't keep your dishwasher in good condition. Once a month, descale your dishwasher by placing a large glass measuring jug filled with white vinegar on the top shelf and running the machine as usual with no detergent. This will mix with the water and leave your dishwasher sparkling clean. Once your machine is clean, you can get added benefits by using the "heated dry" setting to kill bacteria on your sponges and even to give plastic children's toys (without batteries) a spring clean. White vinegar is an ingredient you're going to want close at hand while spring cleaning. This natural cleanser is ideal for removing limescale and will work fabulously at cleaning any build-up around your shower and bathroom sink. Spray it on and leave overnight for best results, and make sure you open the windows or ventilate as much as possible to prevent your room from smelling of vinegar! Just as you clean your bedding every week, you should also be cleaning your pillows and duvet throughout the year. Check the care label on your pillows before putting in the washing machine, and aim to give yours a wash at least twice a year. Your mattress will also need a clean too; start by vacuuming the entire surface with the upholstery attachment on your vacuum cleaner, then check for stains and spot treat them with the appropriate cleaner. Finally, sprinkle baking soda over the entire surface of your mattress and leave for as long as possible – preferably up to 24 hours. This has amazing sanitising properties and will leave your mattress feeling and smelling much fresher. It's easy to forget curtains and blinds during your spring clean, but it can make a big difference to the overall result. Some curtains can be machine washed or dry cleaned, but even a spritz of a fabric refresher spray like Febreze can freshen up your curtains and remove any smells. Meanwhile, you should find a small nozzle for cleaning blinds on most vacuum cleaners. 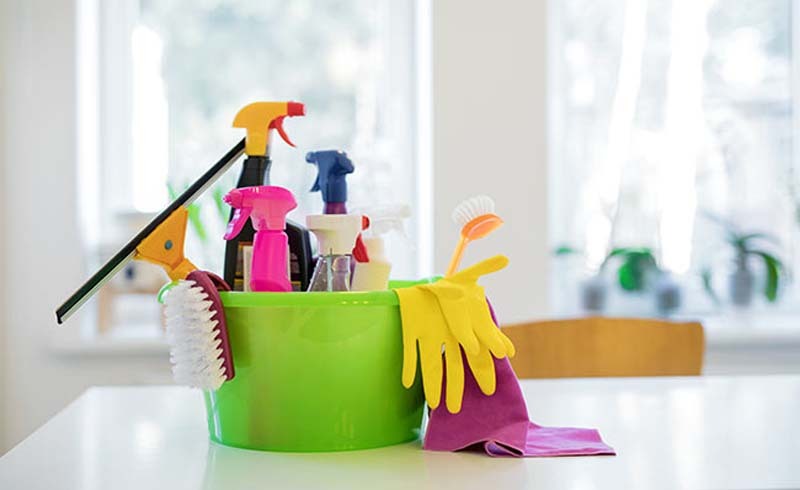 Be sure to clean both sides, and also collect any fallen dust from windowsills.